The National Audit Office has today concluded that the upgrade to the Thameslink routes through London has a realistic prospect of delivering value for money, but there remain risks which the Department and Network Rail need to manage carefully. In particular the Department and Network Rail now face a challenge to be ready to deliver the new services, having not begun this work early enough. Two phases of infrastructure works carried out by Network Rail at a total cost of £5.5 billion (2017 prices). Phase one included the redevelopment of Blackfriars and Farringdon stations, and was completed to time and budget in 2011 and cost £2.4 billion. Phase two began in 2013, and included redeveloping London Bridge station and introducing new track and signalling technology in central London. It has a budget of £3.1 billion. A new fleet of 115 new trains with lease costs of £1.7 billion (present value, 2017 prices), and two new maintenance depots to service them, with lease costs of £0.3 billion (present value, 2017 prices). Under new franchise arrangements a combined Thameslink, Southern and Great Northern (TSGN) franchise was awarded to Govia Thameslink, to maintain and develop passenger services on the Thameslink routes and bring the new trains into service. The total budget for Network Rail’s infrastructure works has increased from its 2012 budget by £474 million (9.4%) to £5.5 billion (2017 prices). The budget for phase two increased by 18.0% from £2,629 million to £3,103 million, and was largely associated with the works at London Bridge. As Network Rail developed its detailed design and accessed the site, it found that conditions at London Bridge were not as expected, requiring changes to the design, additional work, and acceleration of other works to keep to schedule. Since the Department agreed the increased budget, Network Rail has kept its infrastructure budget stable and has improved its financial control of the programme. Network Rail has introduced measures to improve the way it manages design changes and has used more sophisticated cost forecasting techniques. 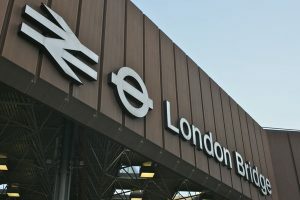 Network Rail has also taken steps to improve the programme’s cost control following cost increases resulting from the impact of design changes at London Bridge. Reporting by the main contractor, Costain, and Network Rail’s contract management, did not immediately bring this to light. The acceptance of the new trains is currently behind schedule, but efforts are being made to recover lost progress. Siemens had difficulties finalising the on-board software for the new trains, which delayed Govia Thameslink’s acceptance of the first train. This meant that Govia Thameslink introduced the first train into passenger service just over three months later than initially planned. Further technical issues emerged when the trains were brought into service. Siemens have sufficiently addressed these issues to allow Govia Thameslink to accelerate its acceptance of trains to make up for lost time. If current progress continues, Siemens will have caught up to the original acceptance schedule by December 2017. Govia Thameslink is also carrying out testing to determine what infrastructure adjustments Network Rail will need to make to fully deploy the trains on the Thameslink network. The wider rail network cannot yet reliably support the Thameslink programme’s new services. Between July 2015 and March 2017, 13% of all cancellations and delays of more than 30 minutes on the franchise have been due to failure of track and other Network Rail assets such as signalling systems. In 2016, Network Rail estimated that an investment of up to £900 million (cash prices) of maintenance and renewal work was needed to achieve the resilience needed to run the new services on the Thameslink network reliably, in addition to infrastructure investments already planned in that area. Limits on access to the railway means that Network Rail has prioritised a £300 million programme of work in its South East and London North Eastern routes to improve particularly vulnerable parts of the network. The Department and Network Rail did not initially make adequate arrangements to manage the introduction of the new services and there is limited time remaining for planning to be completed. Development of these plans also requires a high degree of collaboration across the rail industry, and clarity over who has the authority to make decisions on how the rail network operates. However, the Department and Network Rail did not fully consider what arrangements they would need to manage the transition to bringing the enhanced services into use. In late 2016, the Department and Network Rail established the Industry Readiness Board, consisting of a wide range of industry representatives, to oversee collaborative planning for the new services. In mid-2017, the Department also took steps to better define accountabilities for operational service on the programme. The Department is deferring the full introduction of the new services by up to a year, in order to improve their ability to manage the risks of each service change. The Department and Govia Thameslink had initially planned for a number of services from Sussex and Kent, the Midland Mainline, the East Coast Mainline and Great Northern line to be connected through central London, in May 2018, with more services to be connected from December 2018. The Department requested options from Govia Thameslink to reduce the risks of passenger disruption from introducing too much change on the network at any one time. In October 2017, the Department approved a proposal it had requested from Govia Thameslink to introduce the new services planned for 2018 more gradually, with the final increase in services occurring in December 2019.